The two main characters in the novel are Dorothea Brooke and Tertius Lydgate (very memorable names, I would say). What strikes the reader first about Dorothea is her zealousness, her intense desire for the pious and the good, leading to a severe denial of self. Lydgate is a doctor who is new to Middlemarch, and his noble ambitions are impeded by the unfamiliarity of his new medical ideas. Dorothea’s early, imprudent marriage to a cold and middle-aged intellectual, and Lydgate’s marriage to a woman whom he thinks will provide the necessary happiness and structure to enhance his work, both lead to struggle and subsequent alienation. 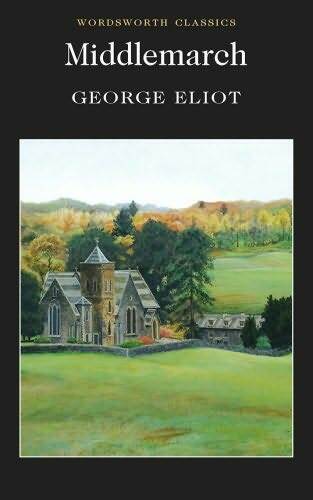 In reading this book, I was really fascinated by Eliot’s depiction of these two relationships in particular, and by the depiction of marriages of other minor characters. There is a plethora of books and movies, especially in our current age, exploring the familiar “will they-won’t they” storyline. Two people are portrayed as they begin to feel an attraction for one another, and as necessary complications and misunderstandings ensue. More often than not, these depictions end when the two express their mutual love or enter into a relationship. This is the “end” instead of the beginning, the beginning of another chapter: of marriage. And yet this is precisely what Eliot does such a masterful job of exploring in Middlemarch. The relationship between husband and wife is explored not only in what they say to each other, but also in what they do not say. Sometimes, these unspoken words are more powerful than the ones that take external shape. The book, in my mind, probes the depths of language: its great potential as well as its failures and ultimate limitations. “He raised his eyes with a little start and looked at her half amazed for a moment: her pale face, her changed, mourning dress, the trembling about her mouth, all said, ‘I know’: and her hands and eyes rested gently on him. He burst out crying and they cried together, she sitting at his side. They could not yet speak to each other of the shame which she was bearing with him, or of the acts which had brought it down on them. His confession was silent, and her promise of faithfulness was silent” (Eliot, Chapter 74). The novel, told in the third person omniscient, flits through the thoughts of many different characters. In doing so, it does not seek to condemn or to judge these characters for their failings, their weaknesses, their poor choices. Rather, it strives to understand, to love and to empathize with them. This reminds me of a C.S. Lewis quote I particularly like: “We do not write to be understood. 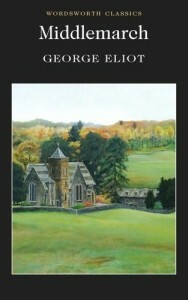 We write in order to understand.” And it is this that I think George Eliot does so well (that is, understand), and which allows her work and her characters to transcend the constrictions of a single historical period. As I see it, there are no villains or heroes in the novel; there are humans: imperfect, broken, and yet beautiful. Although Middlemarch is a very long novel, and was written over a century ago, I think it has much to offer each of us today. I hope you’ll give it a chance, because it is a book that deserves to be read, reread, discussed, and pondered deeply. Middlemarch has been on my list for quite a while, and your interesting review reminded me to find a copy. Have you read My Life in Middlemarch, by Rebecca Mead?